Emphasis on Oral Surgery, Hospital Dentistry, Emergencies, Medical Compromised Patients. Training in Advanced Cardiac Life Support, Advanced Trauma Life Support, Anesthesia, Emergency Room, Orthognathic Surgery, Sedation, Forensics. Academy of General Dentistry, American Dental Association, Iolani School Alumni Assoc. Oregon State University Alumni Assoc., OHSU Alumni Assoc., Psi Omega Dental Fraternity. 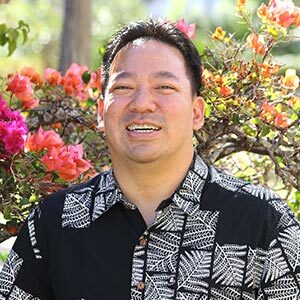 Iolani Class of 1978 Representative – 20 years, AYSO – coach and referee 18 years, Aloha Youth Lacrosse Assoc, Kaneohe Little League, Boy Scouts of America. Church of Jesus Christ of Latter Day Saints. Collecting music, Asst Scoutmaster Boy Scouts, Travel, Cooking. Dentistry is a service and a privilege, improving the health of our patients is my number one priority. With a significant portion of our patients in the military, we make sure they are comfortable and are able to trust us even though we may only be their treating dentist for a few short years. We tell them that we will always be their dentist and that we would be happy to give them any advice no matter where they may be. We will even give them advice for any question; where the best restaurants are, best flowers are, best sights to see; anything! I also love to talk about where any patient is from ; having had a hobby of trying to visit every state in the coun- try and living in quite a few places. For our patients from Hawaii, I have been active in our community in sports, church, and business, especially the Windward Side. Having lived part of my life on this side and my wife being born and raised on this side of the island, and my children are all born and raised here too, I have tried to be part of this community that I love and will always live in. Dr. James Choy was born and raised in Hawaii. Him and his wife, Mina, have three boys – Logan, Mason and Noah. The Choy Ohana is very involved in community sports, schools, and the Boy scouts. In their spare time, they are often found at the beach, fishing, or cheering on University of Hawaii and University of Oregon Sports.